Dell's Inspiron range has long been one of the better consumer lines we've seen, offering a string of high-quality machines at low prices. The Inspiron 17R is its latest big-screen media centre and, despite its poor battery life, is an impressive laptop for the price. With its 17.3-inch screen, this is a machine built for desktop use. At 3.2kg you won't want to carry it far and its 165-minute battery life is quite poor. This drops to just 118 minutes when watching a DVD – barely enough time to finish most movies. The stylish chassis will look great on your desk. The plastic lid and interior use a faux brushed-aluminium finish to create a high-quality look. Build quality is equally pleasing with all panels feeling firmly fixed and suitably resilient throughout, making it ideal for family use. The user interface ably continues this quality with the spacious and responsive keyboard being a pleasure to work with. All keys respond quietly and accurately, while the numeric keypad allows fast data entry. The stand-out feature of this laptop, however, is its glorious 1600x900 pixel resolution 17.3-inch screen. The 16:9 aspect ratio is perfect for watching widescreen movies, while its stunning brightness and colours bring images to vivid life. Deep black levels add to the package for a striking contrast. The use of a dedicated ATi HD 5470 graphics card ensures ample power for media editing tasks and basic gaming. While the Apple MacBook and Samsung R580 prove slightly more powerful, this is a capable multimedia machine for such a low price. 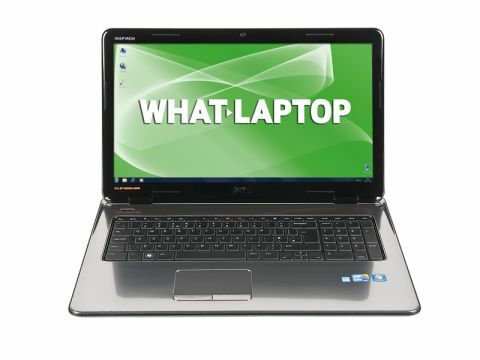 Yet more impressive at this price is the use of a cutting-edge Intel Core i5 430M processor and 4096MB of DDR3 memory. Performance is among the best we've seen from a mid-level consumer machine, although the Samsung R580 is slightly more powerful overall. 802.11n Wi-Fi and Gigabit Ethernet allow high speed wireless and fixed networking. Bluetooth is also in place for wirelessly synchronising and sharing data with devices such as your mobile phone. Finally, this is also the only machine in this group to include Microsoft Works software, providing a range of basic home office tools to let you get to work immediately. A six-month subscription to McAfee SecurityCenter software is also included for online security. If it weren't for its poor battery, the Inspiron 17R would have been a clear candidate for an award this month. Its stunning screen and cutting-edge power make it a great choice, but the improved mobility of the Apple and Samsung push it into third place this time around.